Our first full week of work in the new year has come to an end, and I have to say it feels good to get back into a daily routine. 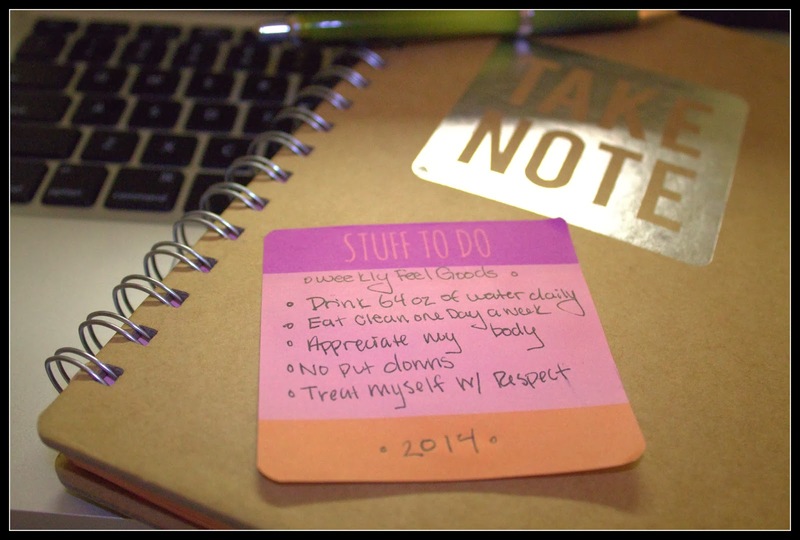 And as the week comes to an end I have found that I have been reflecting a lot on my new 2014 resolutions. I know, the year is still new but I have this energy inside of me that I cannot begin to explain. An energy that is driving me forward to become a better version of myself, and to jump head first into the things I love doing without fear of failure! I just feel as though 2014 is going to be a big year filled with endless possibilities! Anyway, today I wanted to focus on my weekly and daily resolutions (you can read my full resolution post here). Since I broke my 2014 resolutions out into three main parts "The Big Ones," "The Daily Gut Check" and "The Weekly Feel Goods" I have been trying to come up with creative ways to remind myself of my 2014 goals. I know the big resolutions will be easy to remember, because those are the resolutions that are tough, take a long time and will push me way out of my comfort zone. However my weekly and daily check ins are smaller goals and just because they are smaller doesn't mean they aren't important! My smaller goals or check ins I need to think about on a daily/weekly basis. So, here is what I have been doing! I have my weekly "Feel Goods" posted on my planner/notebook. I literally open this book everyday to write something down, so it is hard for me to miss these weekly goals! Just a nice friendly reminder to do something good for myself! My "Daily Gut Checks" those are posted by my bed on a post it. Not the most glamours of reminders but hey its one of the last things I see at night and allows me to think and reflect on if I met my goals for the day. So, there you have it! And with that, Happy Friday!